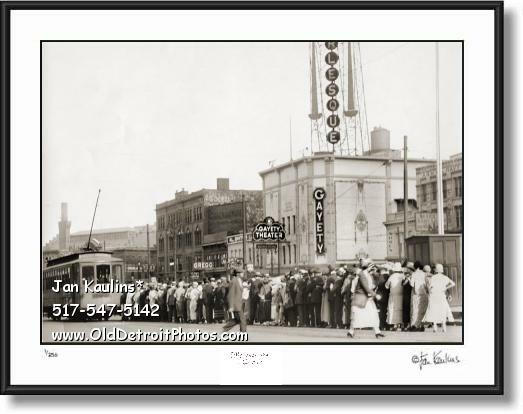 GAYETY BURLESQUE THEATER Detroit 1920's photo picture print photograph for sale. This sepia oned DETROIT GAYETY BURLESQUE THEATRE photo print picture for sale is made from a professionally restored quite rare Original black and white ca 1920's negative/photograph. We can see the crowds of well dressed flappers and men in suites and hats lined up to catch the streetcar across the street from THE GAYETY BURLESQUE THEATER. The Gayety Theater was designed by architect Fuller Claflin and seated a little over 1,300 seats. It opened up in 1912 as a Burlesque Theater and always maintained its original venue until it was torn down in 1958 to make room for a parking lot in downtown Detroit. The Original photo is just a bit soft on the focus but the rarity of this image makes it well worth preserving as a rare historic image of early Detroit. THESE BLACK AND WHITE PENOBSCOT BUILDING DETROIT PHOTO ART PRINTS ARE VERY HIGH QUALITY CONTEMPORARY FINE-ART PHOTO PRINTS MADE FROM THE PROFESSIONALLY RESTORED ORIGINAL OLD VINTAGE HISTORICAL DETROIT PHOTOGRAPHIC PRINTS. THESE SEPIA TONED DETROIT BLACK AND WHITE PHOTOS ARE OFFERED FOR SALE HERE FOR THE VERY FIRST TIME. THEY HAVE BEEN MADE FROM ORIGINAL NEGATIVES OR ORIGINAL FIRST GENERATION PRINTS, MANY OF THEM ARE 50 YEARS OLD AND SOME DATE TO THE EARLY 1920's AND 1930's. THE RARE OLD DETROIT ORIGINAL PHOTOS AND BLACK AND WHITE NEGATIVES USED FOR THESE PRINTS HAVE BEEN OBTAINED FROM HISTORICAL SOCIETIES, NATIONAL ARCHIVES, THE LIBRARY OF CONGRESS AND NUMEROUS PRIVATE COLLECTIONS. IT HAS TAKEN SEVERAL YEARS TO PUT THESE OFFERINGS TOGETHER ON THIS WEBSITE. MANY OF THESE PHOTOS ORIGINALLY CAME FROM OLD DEFUNCT NEWSPAPER AND MAGAZINE ARCHIVES, WHERE THEY WERE USED ONCE FOR A STORY AND THEN USUALLY JUST THIS ONE ORIGINAL PRINT WAS MADE AND KEPT FOR THEIR ARCHIVES. HENCE, THESE HISTORICAL IMAGES WERE NOT ORIGINALLY MADE TO BE FOR SALE, BUT WERE TO BE USED AS IMAGES FOR NEWS STORIES AS THEY UNFOLDED--MAKING THESE IMAGES EXTREMELY RARE HAVING SURVIVED SO MANY YEARS. VERY FEW OF THESE IMAGES HAVE EVER BEEN OFFERED FOR SALE TO THE PUBLIC UNTIL NOW. THE ORIGINAL OLD DETROIT BLACK AND WHITE PHOTOGRAPHS HAVE DIGITALLY BEEN RE-MASTERED AND ALL MAJOR FLAWS, SUCH AS TEARS, SCRATCHES, MISSING PIECES, FOLDS, INK STAINS ETC. ON THESE RARE PHOTOS HAVE BEEN PAINSTAKINGLY REMOVED AND CORRECTED AND HIGH QUALITY PRINTS OF THESE HISTORIC RARE DETROIT BLACK AND WHITE SEPIA TONED PHOTOS ARE NOW OFFERED, FOR THE FIRST TIME, ON THIS WEBSITE WWW.OldDetroitPhotos.COM . THESE PHOTOS HAVE BEEN BEAUTIFUL RESTORED AND ARTISTICALLY SEPIA TONED AND OFFERED IN A LIMITED EDITION OF INDIVIDUALLY PRINTED PHOTO PRINTS. THEY ARE READY FOR DISPLAY IN YOUR HOME OR OFFICE. HERE IS YOUR CHANCE TO OWN AND ENJOY SOME VERY SPECIAL AND UNIQUE DETROIT PHOTOGRAPHIC HISTORY.